A North Yorkshire man has announced that he will be staying indoors on Halloween because he fears the day could kill him. 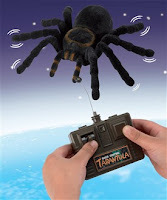 John Stafford, from Scarborough, suffers from an extreme case of arachnophobia and has been told that he could suffer a fatal heart attack if he sees toy spiders on October 31. Reports suggest that the 54-year-old has already collapsed once this month after he spotted joke spiders in a store window while he was out shopping. Stafford told the Yorkshire Post: "When I tell shop owners about it they think it's funny, but it's not a laughing matter. I stop breathing and pass out, it's just terrifying. "My doctor said that my heart is so badly bruised now that a bad attack could be fatal"
Calling for a ban on Halloween displays in shops, he complained: "It's just thoughtless - they don't realise the effect they can have on people." Meanwhile, his wife Maria, 44, said: "The other day we saw a window in Eastborough that had some spiders and I thought I'd nearly lost him. He just slumped and fell against me - I had to hit him with my keys to bring him round." Stafford has reportedly tried hypnosis and medication to combat his problem, but to no avail. If you're not scared of spiders, or fancy dressing up for Halloween - check out http://www.24studio.co.uk/ for fancy dress costumes, sweets & treats, plus much, much more!